The classic flat lid for a Mason jar – the one you need if you are water bath or pressure canning. Also handy to have some around for emergency ran-out-of-the-good-storage-lids moments. The bulk lids sell faster than we can replenish them – if you can’t click that option, we are sold out. 12 flat lids only – bands /rings sold separately here. 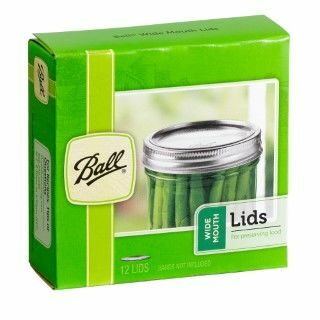 These lids are one time use for canning. After that, they can be reused for pantry, fridge, and freezer storage. They are made of tin plated steel and lined with BPA free plastisol.